I Me My: American Educators to "Stand and Deliver" - US Students Poised to Become Globally Competitive? American Educators to "Stand and Deliver" - US Students Poised to Become Globally Competitive? 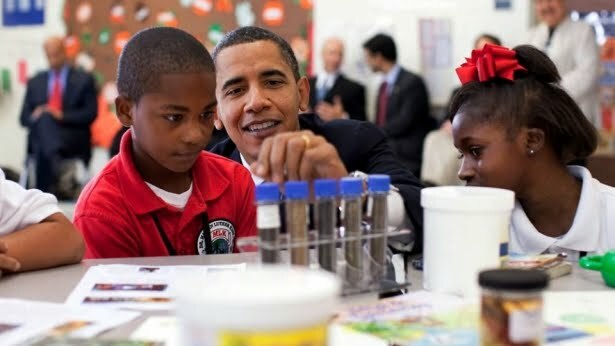 "President Obama’s Council of Advisors on Science and Technology (PCAST) recently released Prepare and Inspire, a report on science, technology, engineering, and math (STEM) education. This report generated relatively little fanfare in the mainstream and online press, but it may someday be seen as a watershed in our nation’s educational history." Clearly, initiatives like Prepare and Inspire are the need of the hour if the US is to bring forth a work force that is globally competitive and can survive the onslaught of a fast growing Chinese economy with tentacles spread across and into every continent. Public education in the US has to gear itself up not just in Science and Math, but also in Language Arts. We need a workforce that is predominantly bilingual like it is in China and India, or else we start off disadvantaged. Putting in state-of-the-art technology in high schools is not a solution by itself . We need teachers to use that technology in order to enhance learning and critical thinking among our students, and that learning has to be at a level that matches up with what's being learned in other developing and developed countries across the world. We cannot dumb down our academics, neither should we manipulate data to get passing numbers that would insure state and federal funding for our schools. We can no longer afford to teach to a test which is antiquated to begin with, and does not meet the standards of a global learning environment. Academic rigor should be the mantra in our public schools, and this mantra has to be designed and implemented by the 'STEM Force' of Jaime Escalantes; Jaime Escalantes who can overcome the system's built-in inertia . The question is how do we identify these 100,000 Jaime Escalantes for the STEM initiative and then find sufficient funding to support them. Furthermore, how do we ensure that the selection of this STEM Force is kosher and not dependent upon and/or embroiled in bureaucratic and administrative politicking. Finally, how do we distribute this STEM Force of Jaime Escalantes such that it reaches the remotest parts of our country? The aforementioned are some difficult questions that the Obama PCAST has to find answers to before a STEM Force can take charge of our debilitate education system. As an educator, I strongly support President Obama s Prepare and Inspire initiative that encourages teachers to 'Stand and Deliver', and I would gladly volunteer time and effort to make this initiative a working reality. I do so agree with that. I love my country and I know that I am very previledged to have been born and raised here. But our school system stinks. My grandson is now nineteen and out of school. But when he was in school he actually was more knowlegable then some of the teachers that were suppose to be teaching him. Especially when it came to history. I think other country's have better teachers then we do. I also think that they demand more from their students.